GNS-1501, 20dBi, 2.4GHz, Outdoor Sectorized Panel Antenna, 120°, N-Female, Pole Mount hardware included. 20dBi, 2.4-2.5 GHz Outdoor Sector Panel WLAN Antenna with 120 Degree coverage, and N-type Female connector for 802.11B/G/N Access Points. Includes U-Bolt Scissor Brackets for Pole Mount and down tilt adjustments. Sector antennas are designed to provide segmented microwave coverage over a selected (sector) area; sector antennas deliver a wider beam width than point-to-point parabolic antennas. Wi-Fi Sector antennas are typically used for wireless connections between LAN base stations, wireless Internet, subscriber networks, PCS and other point-to-multi point communications. This type of setup is usually found in RV Parks, Marinas, or other outdoor areas, where the main antenna is broadcasting a signal from a building that is located at one end of the park. A sector antenna should be used to force the signal in your desired direction, and avoid sending the Wi-Fi signal to unwanted areas. Antenna configurations can consist of flat panel micro strip and slot radiating designs, as well as traditional parabolic configurations. The added signal strength and sensibility that comes with this Outdoor 14dBi Sector Antenna will make your Wireless Installation easier and more secure. Mount this 2.4GHz Sector Wi-Fi Antenna on top of your building, Marina, RV-Park or Hotel, and tilt it towards the desired coverage area for a great signal, and excellent Wireless Coverage. Mounting Hardware is included as well as basic Technical Support to get you started on your Wireless Installation. This 14dBi Sector Wi-Fi Antenna works great in Point to Multipoint solutions as well. Simply Mount the Outdoor Sector Antenna in pairs to create a 240° of Coverage, or in a set of Three, to create 360° of Coverage. You can also use the 14dBi Sector Wi-Fi Antenna as a single, stand-alone Antenna for the desired 120° of coverage. More Clients: By using 3 sectors with 3 Access Points, you can triple the number of clients in a given area. This increases range, reduces latency, and speeds up network efficiency. Better signal levels: Sector antennas usually have more gain than Omni's. This results in fewer retries and less packets lost. By focusing the signal in the desired area, you increase signal strength. Eliminate interference: Because a sector antenna is directional and usually has good front-to-back (F/B) ratio, it can reduce or eliminate interference from sources that are behind the sector antenna. You also eliminate overshooting your clients, which will happen when mounting an Omni antenna too high above the client. Channel Re-Use - Because the sector antenna can be down tilted, mechanically 3, 6, or 8 degrees, the signals are not thrown out to the horizon. This allows that same channel to be re-used several miles away at a different cell site, without overlapping. You can also have 3 separate antennas configured to use 3 separate channels, 1, 6 and 11 simultaneously. For the best results, this Outdoor 2.4GHz Sector Antenna should be used in situations where you have Line-of-Sight to the client locations. 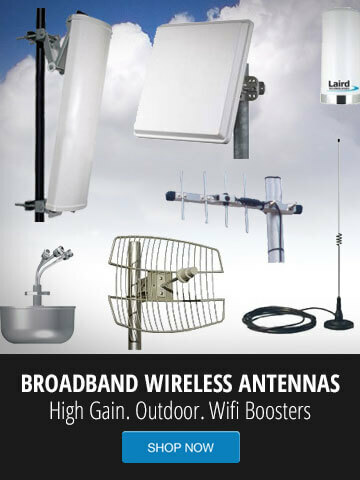 Please contact us if you have questions about your setup, or need higher gain, outdoor Wi-Fi Antennas.